Christophorus Marlovius (Anglice Christopher Marlowe, Cantuariae natus die 26 Februarii 1564; necatus Deptfordiae 30 Maii 1593) fuit poeta et scriptor scaenicus aetate reginae Elizabethae I. Alumnus fuit scholae regiae Cantuariensis et collegii Corporis Christi Cantabrigiensis. Auctor fuit Doctoris Fausti et "blank verse" poemate usus est. In scriptis eius atheismus et homophylophiliae adprobatio a nonnullis recognoscuntur. Protome quae Christophori Marlowe esse censetur (Collegium Corporis Christi apud Cantabrigienses). Inscriptio: "Anno Domini 1585, aetatis suae XXI: Quod me nutrit me destruit"
Terence P. Logan, Denzell S. Smith, edd., The Predecessors of Shakespeare: A Survey and Bibliography of Recent Studies in English Renaissance Drama. Lincolniae: University of Nebraska Press, 1973. David Bevington, From Mankind to Marlowe: Growth of Structure in Elizabethan Drama. Cambridge, Mass. : Harvard University Press, 1965. Tucker Brooke, "The Marlowe Canon" in Publications of the Modern Language Association of America vol. 37 no. 3 (1922). E. K. Chambers, The Elizabethan Stage. 4 voll. Oxonii: Clarendon Press, 1923. Patrick Gerard Cheney, ed., The Cambridge Companion to Christopher Marlowe. Cantabrigiae Cambridge University Press, 2004. Constance Brown Kuriyama, Christopher Marlowe: A Renaissance Life. Ithaca, New York: Cornell University Press, 2002. 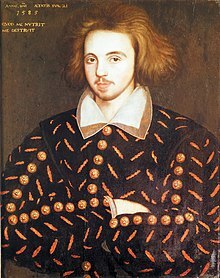 F. P. Wilson, Marlowe and the Early Shakespeare. Oxford: Clarendon Press, 1953. Novissima mutatio die 24 Decembris 2017 hora 18:36 facta.